The Sunday Salon [10.14.12] – my books. my life. Evan’s grandparents are in town this weekend, so we are out having fun instead of reading. Yesterday we went to the zoo to show Evan all of the animals that are way cooler than Gatsby and Daisy. He really enjoyed the fish and the penguins. We ended up purchasing an annual pass, so we’ll be back. After we put Evan to bed last night, Ben and I went out for a drink and a movie – our first date night since the baby (unless you count the wedding we went to). We saw Perks of Being a Wallflower and it was SO GOOD. The book is amazing and the movie really does it justice. It’s October 14th and I am still on my first book. 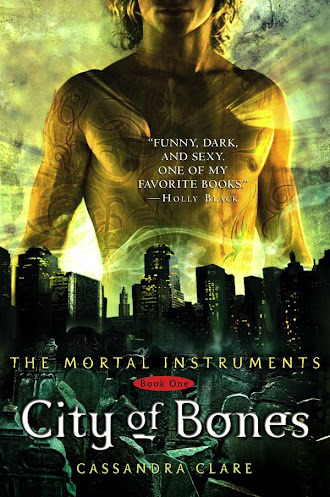 I am reading City of Bones and, although I am only 100 pages in, I am enjoying it a lot. If only I could find some time to read. I am going to have a busy end of the month, I suppose, since I still haven’t really done any of these pins. There is so much baking I want to do and so little baking I am actually doing. October always seems like a really busy month for me. The Readathon (which I didn’t participate in) is the only reason I ever keep up with reading. We are off to the Pumpkin Patch today and then taking Evan swimming for the first time. Have a wonderful Sunday. Over the years, we have spent countless hours at the zoo. It is such a wonderful place to take little kids, and they just don’t get tired of it. Until they are about 10 or 12. I miss those times! I love the zoo too!! We were out of town this weekend so no readathon for me either, I was sad as it approached, but you know, I had so much fun visiting daughter at UNF that it was all good. I’m beginning Read My Own Books Nov 1, and I hope I make some good progress, I’ve made a sort of “wish list” of older titles to get to first, but honestly anything that has been up there a while is up for grabs, which should match any mood. I hope swimming and the pumpkin patch made for a good day.